In the third part of the Darkened Steel questline, the player learns that Darksteel cult members are being assassinated, and must broker an unusual deal in an attempt to track down the killer. Upon returning to Solitude, the player will be greeted by what appears to be the aftermath of an assassination. Tikrid will be in the crowd that has gathered. 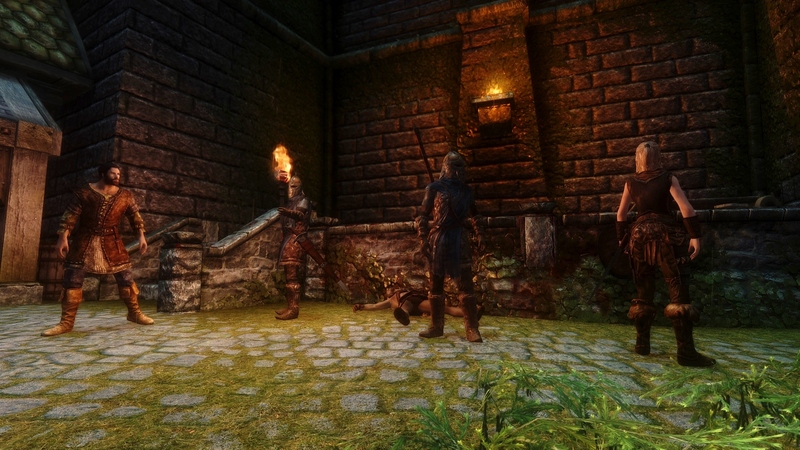 Noticing the player, she will disclose somewhat incredulously that the killer was able to escape undetected even though the killing took place within range of the guards. As the mob disperses, Nasrin appears in the shadows, claiming to know who’s responsible. He cites a yellow-eyed Redguard girl, his nemesis for some time, as they are both hired killers and she has beaten him to every target. 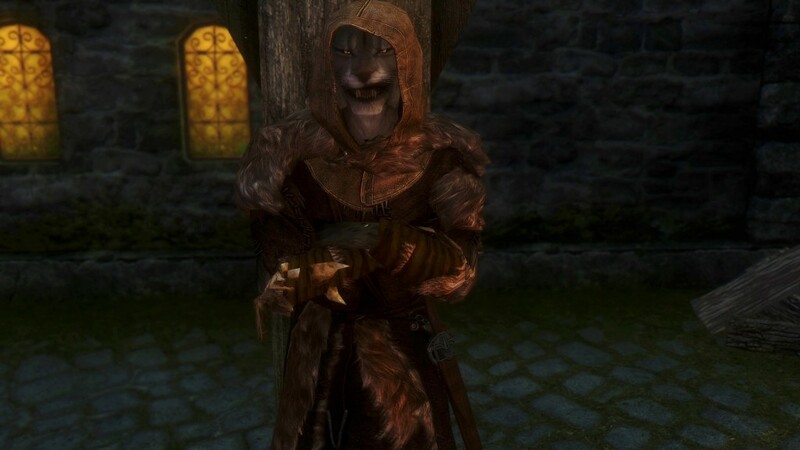 Their acrimony stretches back to guild membership of the Dark Brotherhood, where she steadfastly proved to be a superior assassin. When he left to freelance, he discovered she had taken the same route. He explains that targets are simply taken from a list compiled by citizens, bypassing the black sacrament, but is unforthcoming on who oversees the operation. He proposes Tikrid and the Dragonborn take the targets’ names from him, and save them from the Redguard, freeing him to kill them at a later date. Though outraged at the prospect of only delaying the targets’ deaths, Tikrid concedes that Nasrin is their only lead, and can be killed before he fulfils the contracts. Nasrin reveals the next target is Krillo, who can be found sitting at the bar of the Silverblood Inn at Markarth. Krillo will assume that the approaching pair are there to kill him, nonchalantly explaining that he was told to expect a Redguard with eyes like a cat. He became a Darsksteel member through his wife, whom he met whilst a member of the Forsworn and protecting a Briarheart. In a moment’s absence she assassinated him, and they came to blows. Merciful in victory, she opted to recruit him to the Darksteel clan rather than kill him. Now a widower, he laments the ruination of Wanderer’s Rest, as he can no longer be confident that they’ll spend the afterlife together. He describes the Darksteel’s work as theft, piracy, and assassinations, reasoning that though they act outside the laws of man, they ensure the victims are those they feel deserving, with any disputes being referred to the one who chose them. Members are chosen for their independent nature, and he’s confident they’ll continue and thrive, perhaps still adhering to traditions, but feels the bond of brotherhood has been destroyed along with the promise of the afterlife, the ceremonies only applied for the sake of tradition. Krillo will leave for a morning walk, and the player should follow him as he makes his way to the bridge. During the walk, his conversation with Tikrid reveals that he visits this area every day at 10am, using it as a vantage point from which he hopes to lure the killer and push her to her death onto the street below. Realising the assassin will have studied his routine, Tikrid suggests shadowing Krillo on his forthcoming walks, and observing him from a secluded area outside the temple of Talos. She returns to the inn to rest. As Krillo returns to his vantage point on the bridge the following morning, an invisible assassin sneaks up behind him. 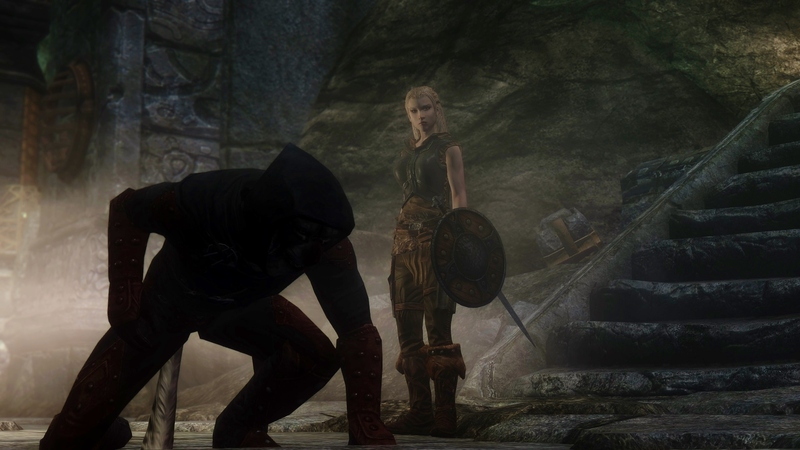 Detecting him just in time, Krillo retaliates, dropping the assailant’s invisibility spell to reveal a Nord male. When he’s been killed, Krillo will observe that he’s a decoy, as Tikrid points out an assassin in Dark Brotherhood armour running towards Understone Keep. Pursuing, the pair will be led to the Nchuand-Zel Excavation Site, to find a badly injured Nasrin huddled on the ground. Attempting to continue the chase, Tikrid runs into some traps, and Nasrin advises that persisting is futile. 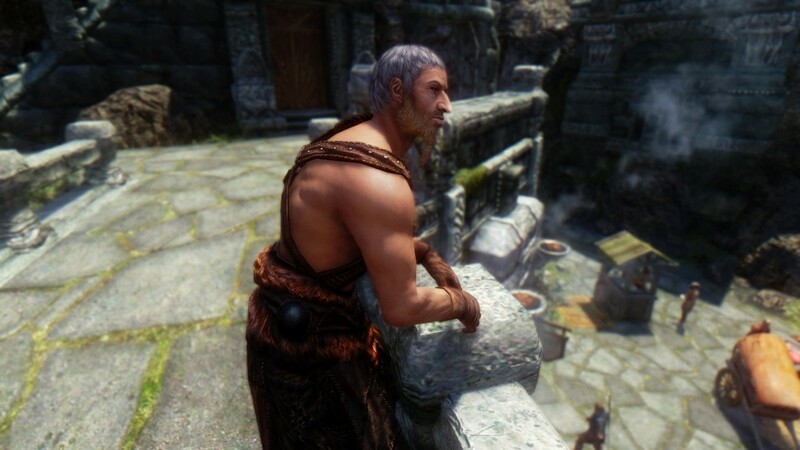 He confesses that he was initially there to kill not only the Redguard but also Tikrid and the Dragonborn, and was confident his plan had come to fruition when he saw the assassin behind Krillo. Realising his mistake and seeking cover, he inadvertently ran into the trap his rival set for him. Tikrid asks if the contract killer is her long lost childhood friend Sahlene, and Nasrin suggests she already knows the answer as he draws his last breath. Suspecting another misdirection, Tikrid proposes she searches the ruins whilst the player heads back to Krillo, who rewards them with a levelled alteration armour spell. When the player asks what he’ll do now, considering the assassin is still at large, he’ll suggest it more pertinent to put a stop to the person compiling the contracts. 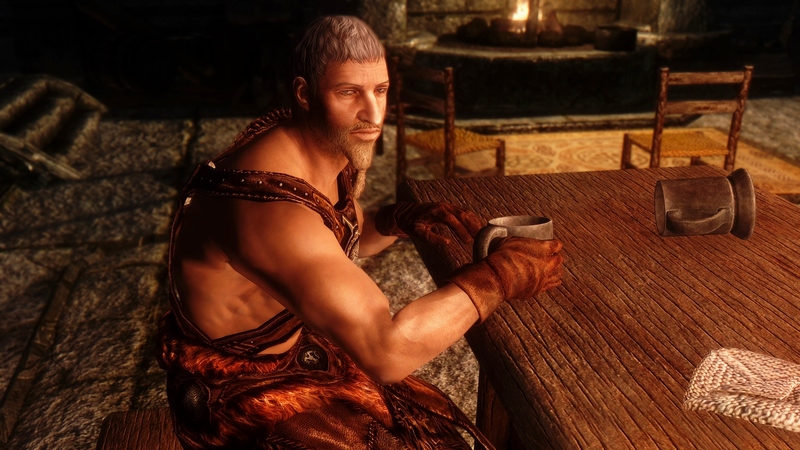 He advises contacting Erevan, a Dark Elf who shared that he’s investigating the murders when warning him of an impending assassination attempt, before leaving for Windhelm. The next quest in the Darkened Steel line commences, and the player should make their way to the Temple of Talos in Windhelm to continue with Deathbroker. -A full set of Dark Brotherhood armour can be looted from both the bridge assassin and Nasrin. Stages 10, 20, 30, 40, 50, 65, 70, 75, 80, 110, 115, 130, 140, 150, 160, 170, 190 are scenes and triggers used to progress the quest.